Such beautiful energy. And I didn’t want to set up a treasure hunt. Fortunately, M had an inspiration and said, “I have something for you to hunt for. See if you can find a blue flower that’s in this part of the garden.” She pointed to indicate an area with plants that was close to her and I could see that there was a solo blue flower peeking out from under a large green bushy plant. LP happily hunted and when she found and picked the flower. The treasure hunt evolved from there. M offered her a glass jar to hold the treasures. She dropped the flower in and asked for the next clue and then raced around to find “something under the lemon tree.” She brought back a lemon and dropped it in and M gave her the next clue to find a flower that grew by the birdhouse. When she had that, I gave her the next clue of finding a leaf from a plant that she could eat (basil). LP enjoyed her treasure hunt and we enjoyed watching her AND still got to have our chat. It was pretty easy to spot things around the garden to include in the hunt and the game came to a natural end when she decided to pick lemons instead. I’m looking forward to trying out our on-the-spot treasure hunt again. Perhaps next time we are in the woods or on a nature walk….although really, we could do it around the house too. 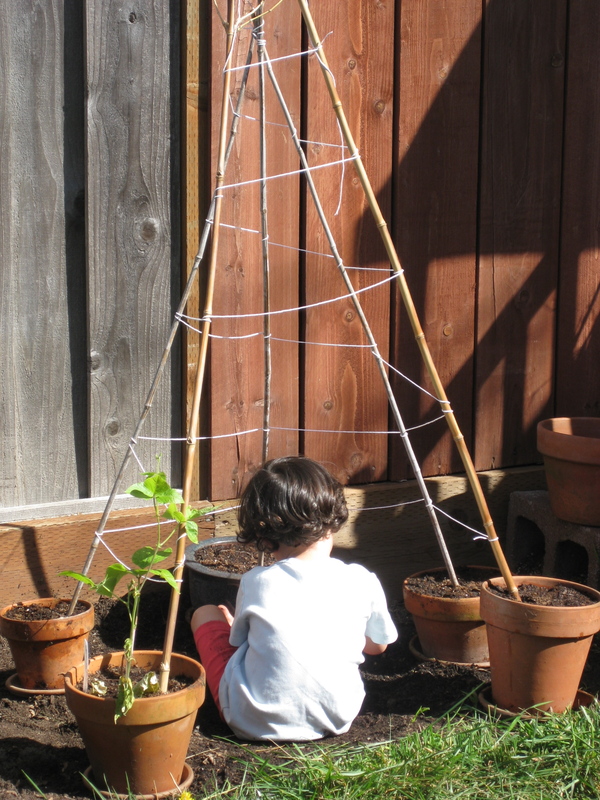 One of my garden projects this spring is creating a bean teepee. 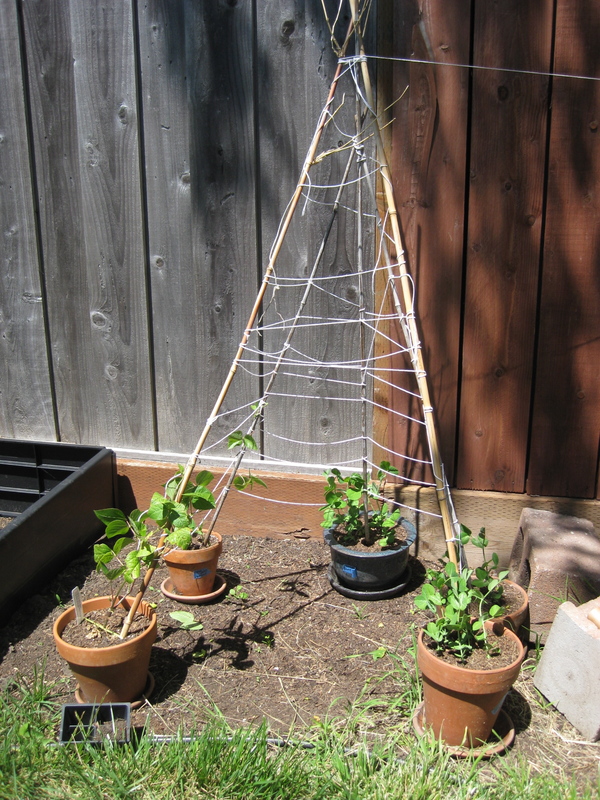 I set it up a few weeks ago with one scarlett runner bean seedling that LP chose at the nursery and many pots that LP & I planted with sugar snap peas. 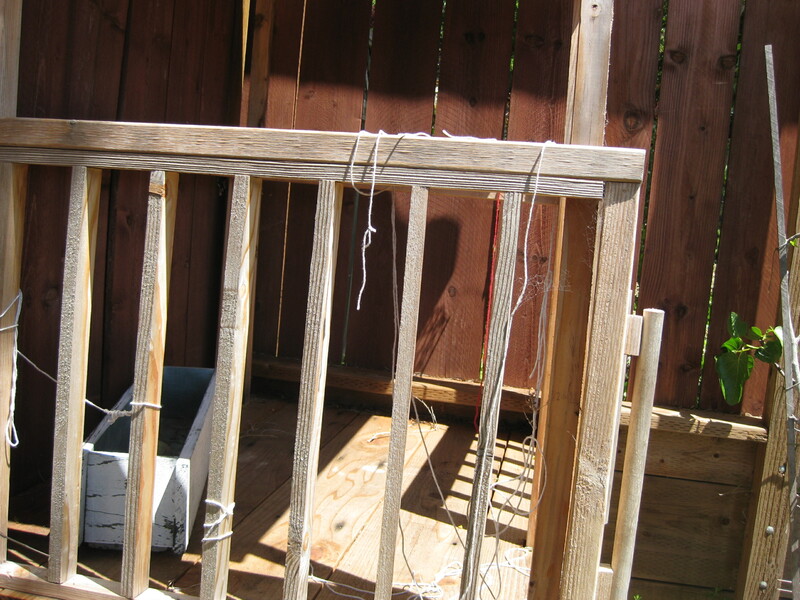 LP has been disatisfied with the amount of string on the poles, so I finally got around to getting another roll of string and fixing it up. 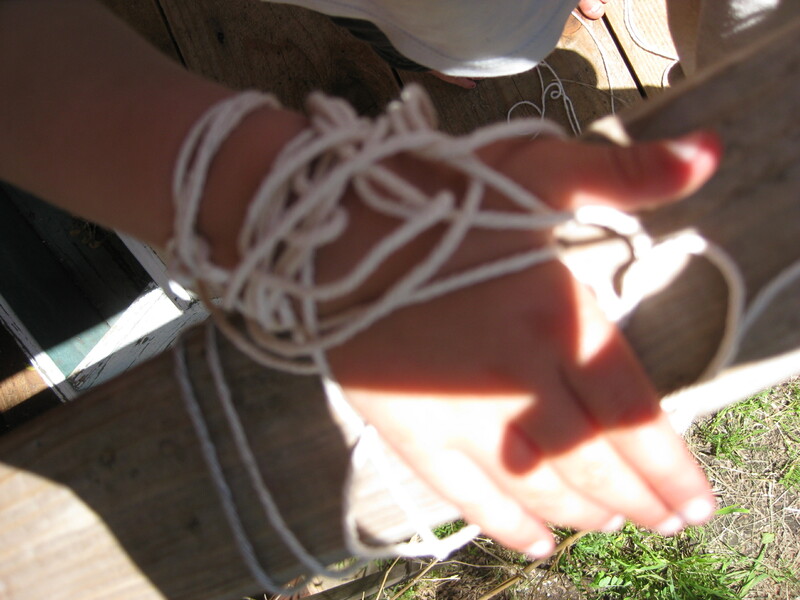 And then of course, there was string to be played with! LP unrolled lengths of string and I cut them for her and she put her creativity to work. I forget sometimes how one new thing in a playspace can be the inspiration for a different kind of play. This is a year that I”m wanting to evolve our little yard into a more fun place to be and I can see how keeping the movable elements in mind (string/balls/boxes/indoor toys that can venture out) will feed LP’s imagination and play in new ways. 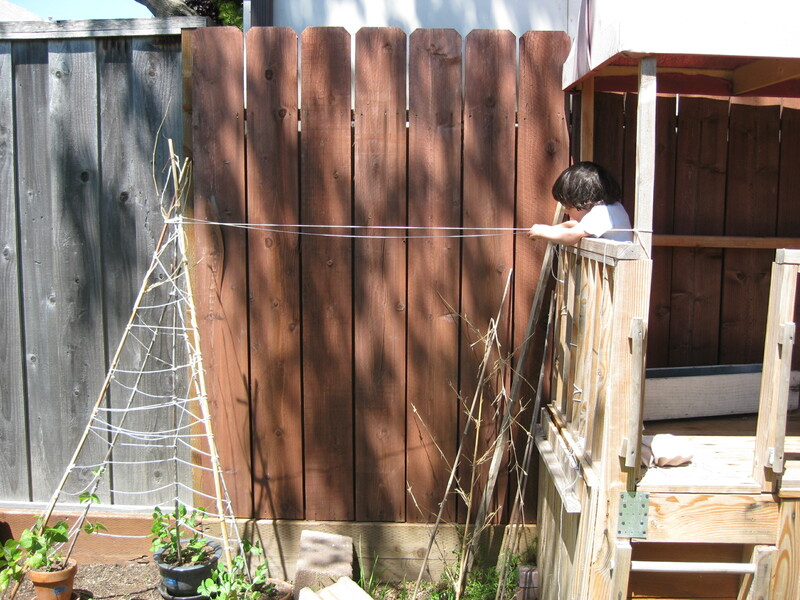 This post is part of “We Play” at Childhood 101…this group of posts focus on outdoor play with lots of great ideas. Last year I thought there was no way I could possibly write 50,000 words in a month. Signing up (and being public about it) was the best and loudest YES to doing the impossible I could think of. It was a great and crazy ride and I made it…finished the month with 50,050 and have slowly been working on editing and revising over the year. It was truly amazing. On November 1st last year, I had no idea I had a novel in me and now it is what I’m doing…writing novels! Of course I have dreams of being published but in the short term the project of writing a big story feels hugely ambitious, hard and wonderful. Since I’m not done with that process on my first novel, it seems a bit much to start in on writing the second one (which is a sequel). AND the energy and fun of the process has got me hooked…so I’m in. I’m doing it. Actually I’m 1/10th of the way there as I type this entry with 5, 522 words written. I’m finding it much easier this year, at least the first few days because I feel much less serious about trying to get it the writing right the first time…a little more able to leap around in the story in my head and just write. What will happen first? 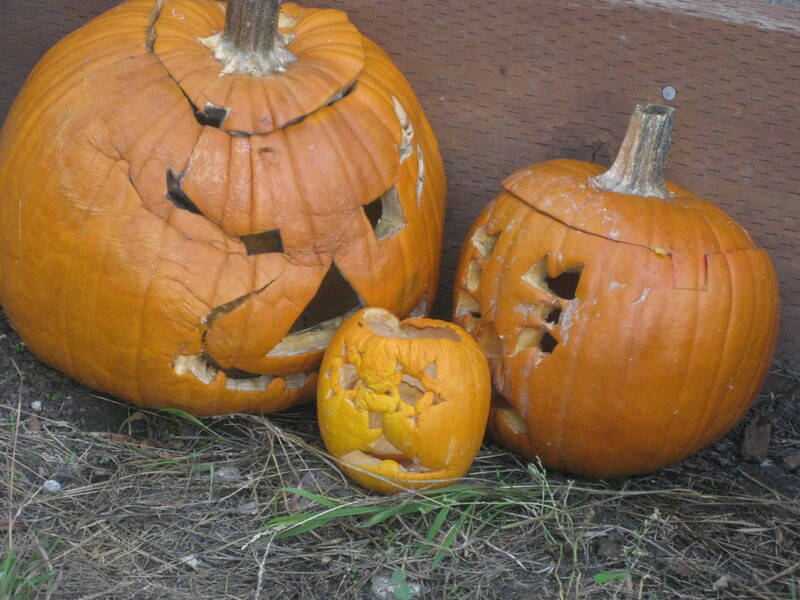 50,000 new words or decomposed pumpkins? LP’s favorite thing in our wee garden this year has been the carrots. Unfortunately, most days she does not want to eat the carrots (and does not want anyone else to eat the carrots). I’m really not sure why because this girl will eat anything that she can pick herself — tomatoes and peas, of course but also radishes, kale, and okra. For whatever reason, she’s decided that the carrots are to play with and not to eat. There has been more than one meltdown when I wanted take a carrot or two to use for dinner. Our friend T who was visiting for a few days had coaxed her into eating a carrot and there was much added pleasure in the carrot experience. Until she picked this one. I was excited about it. Look at it! It is totally cool! 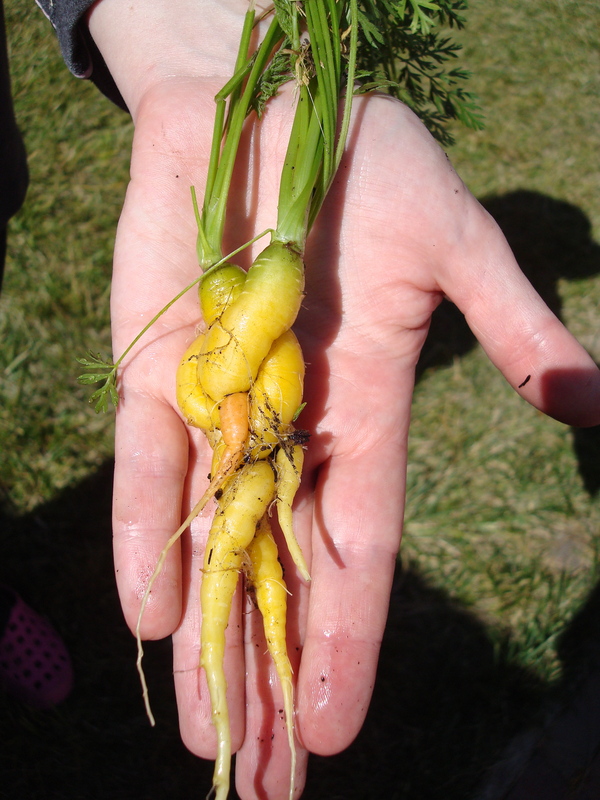 I was all ready to jump into exploring the way the five carrots had grown together. LP pretty much shrugged and was ready to move on to something else all together. I was puzzled. I watched her play with other things while T and I marveled at it and took a bunch of photos. She did make her way over to us and then took the carrot off for her own exploration…and eventual snack. I wonder what her thought process was. My best guess is that she had an expectation of what was going to come out of the ground and when that expectation was not correct, she needed a little time to regroup and let the expectation go. She needed time to be able to say “yes” to the unusual carrot. When I think about the experience in that frame, I feel so empathetic because even at my best, I have trouble switching gears when I have strong expectations. Even when I really, really, really want to say “yes” because the new, unexpected thing looks fun or delicious or intriguing, I need time to make an internal shift. It was a great reminder for me to not push too hard or fast when I think something is “interesting.” The wacky carrots were still wacky and wonderful 15 minutes later. 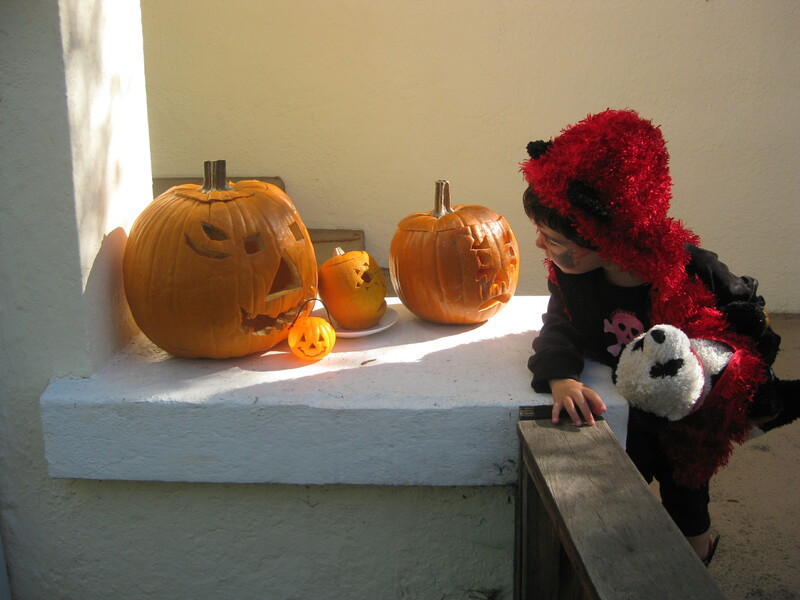 This post is part of the Moms’ 30 Minute Blog Challenge over at SteadyMom. This idea is borrowed from our friends down the block. 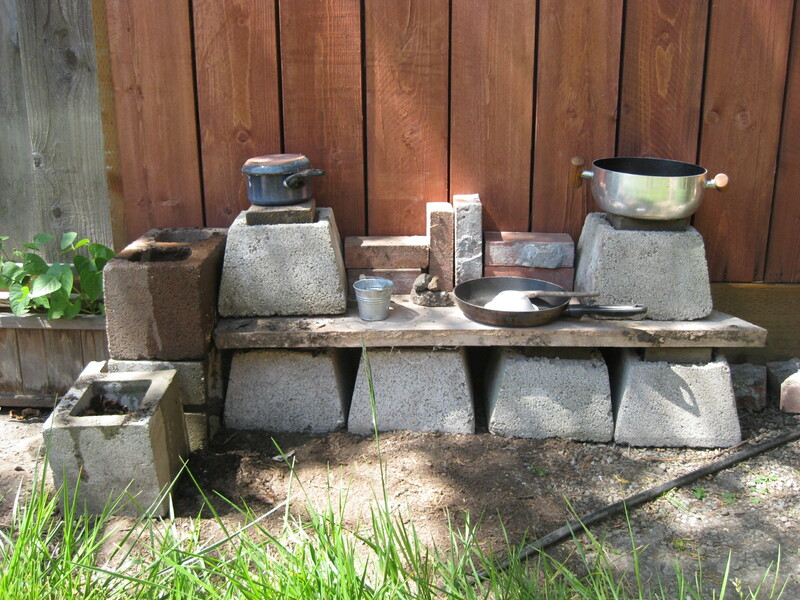 Last week when LP & I went over to play, her friend E showed us his outdoor kitchen. 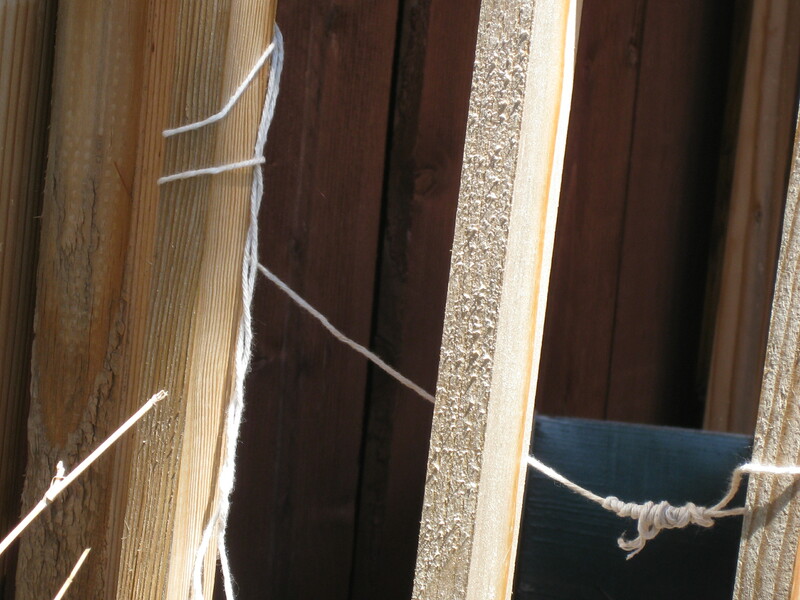 I thought it was a brilliant idea AND we have a lot of old building supplies hanging around (cinder blocks, slate slabs, bricks). Since we rent and the owner wants to hold on to this stuff, this is a great way to use it and not just keep moving it out of the way. LP & I planted a “kitchen garden” of parsley, basil & poppies in the cinder blocks. We’ll see what happens…for the meantime, it has added a new fun element to the yard. This post is part of the Moms 30 minute blog challenge over at SteadyMom. This past week has been going on for years. There has been a lot of screaming from LP and a lot of insomnia from me (I’m not sure if there is a direct relationship or if those are two things that just happen to be going on simultaneously). A fairly disastrous combination. She is tired and wants me to do everything for her; I am tired and want her to please just go play for a while. She’s at the end of her rope and so am I. Our playful spirit has not been present as we retract to just plain coping, coping, coping. I can see the factors that add up to this moment. The transition from being away to back home is always difficult for LP and we have a house guest for a week (a dear friend we haven’t seen who is lovely in just about every way and has spoiled us rotten with his cooking while we treat him to hours of screaming) which shakes things up. And a growth spurt. And a number of little things that have kept our regular routine from being that comfort that I’ve witnessed it be for LP. So I’ve been battening down the hatches. Looking for ways to slow down our day, do less. So much less that I’m climbing the walls a bit. But it seems to be helping. Slowly. Very, very slowly. This afternoon, I had a big feeling of dread. I could see she was feeling tender and thought I needed to come up with something really great to offer to do when all I really wanted to work on a gardening project. The side of our house has gone wild with grass and poppies and a huge thorny blackberry plant that produces no berries. Since we have so little gardening space, I want to reclaim it. 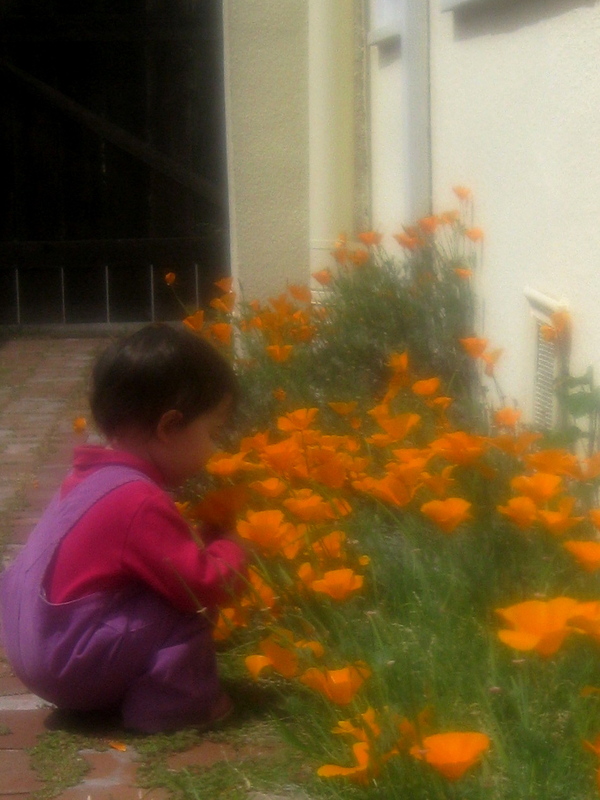 I had been hesitating because I love the poppies; I find them such a cheerful flower. So the current batch is past flowering and I realized it was the right moment to collect seeds from the pods and then plant poppies at will. Since I really had no energy for anything else, I told LP that we were going to do a gardening project expecting it would probably last all of 10 minutes, at best. As it turned out, seed collecting was the perfect thing for us. We sat together on the path, picking and emptying pods. And talking. There was no screaming. Not a single one. When she was ready to move on, she did. No fuss. I sat and continued my seed collecting and then started pulling them out. LP came and went, moving between her own play and being with me. For over an hour. And by bathtime tonight, I had a little playful spirit back. Not 100% but good enough. 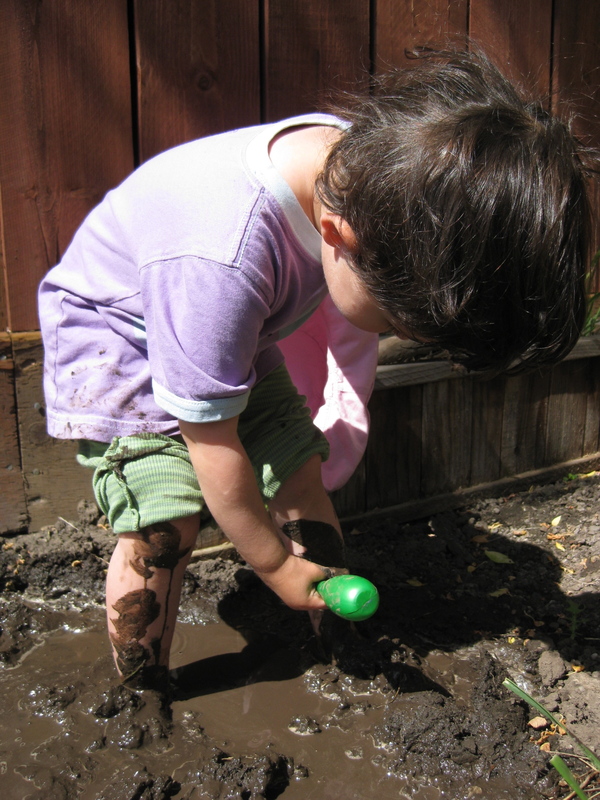 Spring has come at last…and nothing is better than celebrating with mud. 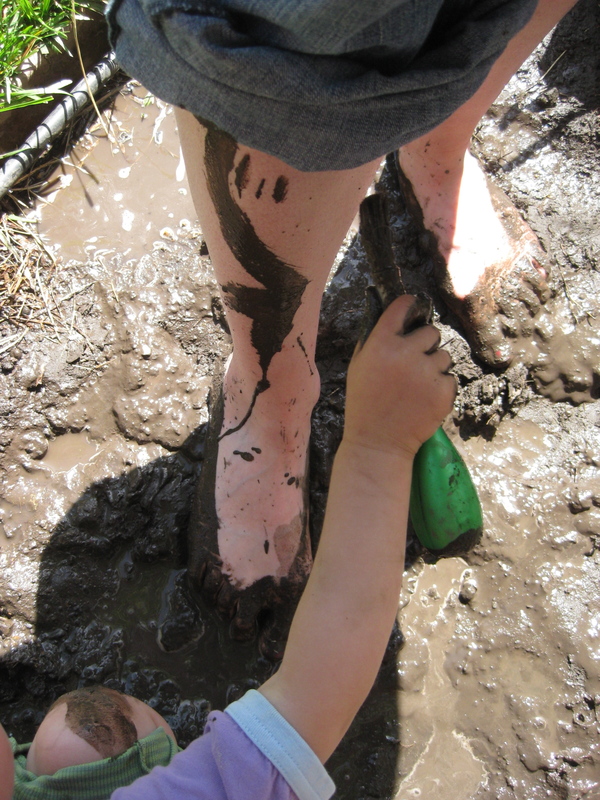 LP & I made a fine mud puddle in a corner of the yard and set to play with it. Mud painting was the biggest hit with her on this day. That’s my favorite kind of play. Open-ended and messy. The mud puddle was in the sun and gloriously warm and squishy. Improv-a-Mama gets some expert mud painting on her leg.